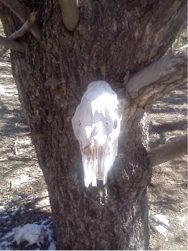 bone tree is an acoustic band from the Unaweep Canyon of Western Colorado. We have been playing throughout western Colorado since 2012 at venues including Mesa County Fair, Hilltop Summer Concert Series (Rifle), Pea Green Saturday Night (Pea Green), various Farmers Markets, restaurants, and lots of private parties. bone tree features “deep canyon music” …songs that have the depth of American music rebuilt note by note to create a new and exciting sound. You’ll hear them play everything from Bill Monroe standards to stuff from Credence Clearwater Revival…from yodeling classics to songs they wrote themselves. Lisa plays her banjo, Bob is over on the guitar or mandolin and sings, Dean plays the big upright bass, occasional guitar, and sings too. Our fans call themselves “boneheads” …a tribe bone tree is proud to call their own. Read about the band on the page links and follow their schedule under GIGS. bone tree will be performing again around Western Colorado over the spring and summer of 2016 including the Palisade Blue Grass Festival, Mesa County Fair, Delta Summer Concert Series and we hope to see you in the audience. Let us know what you think of this style of music and please follow bone tree on this blog…post dem comments! Here is a photo of the Unaweep Canyon. There is a tree named “bone tree” hidden in this canyon. This photo shows an area of the canyon where you might find the bone tree …that is if you were ever going to to try to look for it. 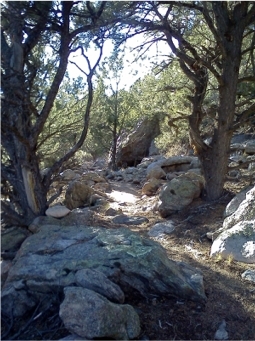 Here is a typical trail in the area that could lead to the bone tree. Most of the trails in this area look just like this one. None are marked. There are cougars and bobcats in the area all the time. Be careful as they can strike without a sound. 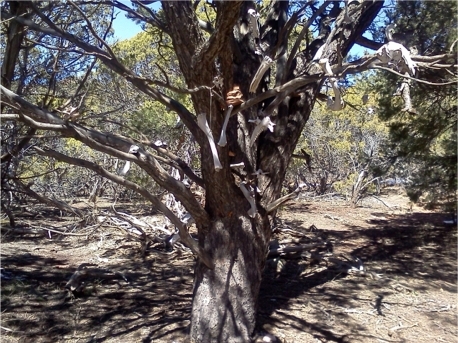 Eventually, if you look long enough, you might find the bone tree. Here is a picture of it looking east. Don’t ask for directions to the tree…the band will likely send you to the wrong place. The tree has over 100 bones hanging in its branches. If you happen to ever come across it, please add more bones and re-hang any that may have blown off and are laying on the ground. Be aware that the tree is on PRIVATE PROPERTY. Please respect it, the land, and the family that hosts it. My husband and I look forward to hearing BoneTree when we are in Grand Junction! We the members of the group! I mean we love the members of the group! Great music, we went to Mud Springs this year again and missed you. The banjo is really sounding good, I wish that I could tell you that I had progressed like that during the last year.